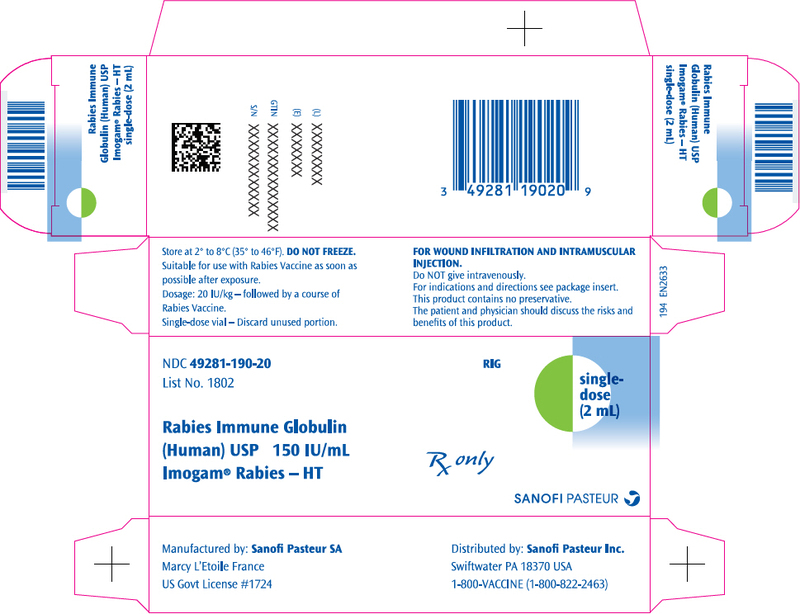 Rabies Immune Globulin (Human) USP, Heat Treated, Imogam® Rabies – HT, is a sterile solution of antirabies immunoglobulin (10-16% protein) for wound infiltration and intramuscular administration. Rabies immune globulin (RIG) is prepared by cold alcohol fractionation from pooled venous plasma of individuals immunized with Rabies Vaccine prepared from human diploid cells (HDCV). The product is stabilized with 0.3 M glycine. The immune globulin solution has a pH of 6.8 ± 0.4 adjusted with sodium hydroxide or hydrochloric acid. No preservatives are added. Imogam Rabies – HT is a clear or slightly opalescent, colorless or pale-yellow or light-brown liquid. During storage it may show formation of slight turbidity or a small amount of visible particulate matter. A heat-treatment process step (58° to 60°C, 10 hours) to inactivate viruses is used to further reduce any risk of blood-borne viral transmission. The inactivation and removal of model laboratory strains of enveloped and non-enveloped viruses during the manufacturing and heat treatment processes for Imogam Rabies – HT have been validated by spiking experiments. Human immunodeficiency virus, type 1 (HIV-1) and type 2 (HIV-2) were selected as relevant viruses for plasma derived products. Bovine viral diarrhea virus and Sindbis virus were chosen to model hepatitis C virus. Porcine pseudorabies virus was selected to model hepatitis B virus and herpes virus. Avian reovirus was used to model non-enveloped RNA viruses and for its relative resistance to inactivation by chemical and physical methods. Finally, porcine parvovirus was selected to model human parvovirus B19 and its notable resistance to inactivation by heat treatment. Removal and/or inactivation of the spiked model viruses was demonstrated at the precipitation III stage of manufacturing. In addition, inactivation was demonstrated to occur during the 10-hour (58° to 60°C) heat treatment process for the representative enveloped and non-enveloped viruses. The product is standardized against the United States (US) Standard Rabies Immune Globulin. The US unit of potency is equivalent to the International Unit (IU) for rabies antibody. The minimal potency is 150 IU/mL. Rabies is a viral infection transmitted in the saliva of infected mammals. Worldwide, both dog and bat saliva exposures appear to be major contributors (see below) with or without apparent bites. The virus enters the central nervous system of the host causing an encephalomyelitis that is fatal. The United States has experienced a substantial decrease in human rabies cases acquired from indigenous domestic animals. International travelers to areas where canine rabies remains enzootic are at risk for exposure to rabies from domestic and feral dogs. (1) Infectious sources of cases of rabies in dogs in the United States in recent years were wildlife reservoirs or dogs that were translocated from localities where canine rabies virus variants still circulate. In order to manage potential human exposures to rabies appropriately, the risk of infection must be accurately assessed. Rabies virus is usually transmitted by the bite of a rabid animal (dog, bat, etc.) but can occasionally penetrate abraded skin contaminated with the saliva of infected animals. Progress of the virus after exposure is believed to follow a neural pathway, and the time between exposure and clinical rabies is a function of the proximity of the bite (or abrasion) to the central nervous system and the dose of virus injected. The incubation is usually 2 to 6 weeks but can be longer. After severe bites about the face, neck, and arms, it may be as short as 10 days. After initiation of the vaccine series (human diploid cell origin), it takes approximately one week for development of immunity to rabies; therefore, the value of immediate passive immunization with rabies antibodies in the form of Rabies Immune Globulin (Human) cannot be overemphasized. Centers for Disease Control (CDC) recommendations were derived from data on the safety and efficacy of active and passive rabies immunization from both uncontrolled human and animal studies. Physicians must evaluate each possible rabies exposure. Consult local or state public health officials if questions arise about the need for treatment. Consider the following factors before specific antirabies treatment is initiated. An unprovoked attack might be more likely than a provoked attack to indicate the animal is rabid. Bites inflicted on a person attempting to feed or handle an apparently healthy animal should generally be regarded as provoked. Consult the local or state health department following a provoked or unprovoked exposure to determine the best course of action based on current public health recommendations. Rabies is commonly transmitted by inoculation with infectious saliva. The likelihood that rabies infection will result from exposure to a rabid animal varies with the nature and extent of the exposure. Two categories of exposure should be considered, bite and nonbite. Any penetration of the skin by teeth. A properly immunized animal has a minimal chance of developing rabies and transmitting the virus. Administer Tetanus prophylaxis and measures to control bacterial infection, as indicated. The following recommendations are only a guide. Apply these in conjunction with knowledge of the animal species involved, circumstances of the bite or other exposure, vaccination status of the animal, and presence of rabies in the region. Consult local and state public health officials if questions arise about the need for rabies prophylaxis. During the 10-day observation period, begin post-exposure prophylaxis at the first sign of rabies in a dog, cat, or ferret that has bitten someone. If the animal exhibits clinical signs of rabies, it should be euthanized immediately and tested. Initiate post-exposure prophylaxis as soon as possible following exposure to such wildlife unless the animal is available for testing and public health authorities are facilitating expeditous laboratory testing or it is already known that brain material from the animal has tested negative. Other factors that might influence the urgency of decision-making regarding initiation of post-exposure prophylaxis before diagnostic results are known include the species of the animal, the general appearance and behavior of the animal, whether the encounter was provoked by the presence of a human, and the severity and location of bites. Discontinue vaccine if appropriate laboratory diagnostic test (i.e., the direct fluorescent antibody test) is negative. The animal should be euthanized and tested as soon as possible. Holding for observation is not recommended. Rabid or suspected rabid Immediately begin prophylaxis. Unknown (e.g., escaped) Consult public health officials. Wild skunks, raccoons, foxes, and most other carnivores; bats† Regarded as rabid unless animal proven negative by laboratory tests‡ Consider immediate prophylaxis. Livestock, small rodents, lagomorphs (rabbits and hares), large rodents (woodchucks and beavers), and other mammals Consider individually Consult public health officials. Bites from squirrels, hamsters, guinea pigs, gerbils, chipmunks, rats, mice, other small rodents, rabbits, and hares almost never require antirabies post-exposure prophylaxis. Do NOT administer Imogam Rabies – HT in repeated doses once vaccine treatment has been initiated. Repeating the dose may interfere with maximum active immunity expected from the vaccine. Administration of rabies post-exposure prophylaxis is a medical urgency, not a medical emergency, but decisions must not be delayed. Rabies Immune Globulin (Human) USP, Heat Treated, Imogam Rabies – HT, is made from human plasma. Because this product is made from human plasma, it may carry a risk of transmitting infectious agents, e.g., viruses, the variant Creutzfeldt-Jakob disease (vCJD) agent and, theoretically, the Creutzfeldt-Jakob disease (CJD) agent. The risk that such products will transmit an infectious agent has been reduced by screening plasma donors for prior exposure to certain viruses, by testing for the presence of certain current virus infections, and by inactivating and/or removing certain viruses. An alcohol fractionation procedure used to purify the immunoglobulin component removes and/or inactivates both enveloped and non-enveloped viruses to a certain extent. An added heat treatment process (60°C, 10 hours) further inactivates both enveloped and non-enveloped viruses. Despite these measures, it is still theoretically possible that known or unknown infectious agents may be present. Report all infections thought by a physician possibly to have been transmitted by this product to the Pharmacovigilance Department, Sanofi Pasteur Inc., 1-800-822-2463. Discuss the risks and benefits of this product with the patient. Prior to administration, review the patient history for possible sensitivity to human immune globulin. Epinephrine injection (1:1000) must be immediately available should an acute anaphylactic reaction occur. Imogam Rabies – HT is not for intravenous administration. Do NOT administer intravenously. Use a separate, sterile syringe and needle or a sterile disposable unit for each patient to prevent transmission of hepatitis or other infectious agents from person to person. Do not recap needles. Dispose of needles and syringes according to local biohazard waste guidelines. Before administration, inform patients, parents or guardians of the benefits and risks of administration of Imogam Rabies – HT. Instruct patients, parents or guardians to report any serious adverse reactions to their healthcare provider. Postpone immunization with live vaccines until at least three months after Imogam Rabies – HT administration because of the possibility that antibodies in the globulin preparation may interfere with the immune response to the vaccination. Animal reproduction studies have not been conducted with Imogam Rabies – HT. It is also not known whether Imogam Rabies – HT can cause fetal harm when administered to a pregnant woman or can affect reproductive capacity. Administer Imogam Rabies – HT to a pregnant woman only if clearly needed. Immunoglobulins are excreted in maternal milk. Caution should be exercised when Imogam Rabies – HT is administered to a nursing woman. Mild - aware of symptoms but easily tolerated [pain described as tenderness upon touch; erythema, bruising, induration/ swelling <1 inch (2.5 cm); occasional site pruritis; fever (oral temperature 37.5-38.5°C)]. Moderate - discomforting enough to interfere with normal daily activity [pain on movement; erythema, bruising, induration/swelling of 1–2 inches (2.5–5 cm) in diameter; frequent site pruritis; fever (oral temperature 38.5-40°C)]. Severe - subject bed-ridden [disabling pain that limited motion; erythema, bruising, induration/ swelling >2 inches (>5 cm); continuous site pruritis, fever (oral temperature >40°C). The following additional adverse reactions have been identified during postapproval use of Imogam Rabies – HT. Because these reactions are reported voluntarily from a population of uncertain size, it is not always possible to reliably estimate their frequency or establish a causal relationship to Imogam Rabies – HT exposure. Encourage reporting by patients, parents or guardians of all suspected adverse reactions occurring after Rabies Immune Globulin (Human) administration. Report suspected adverse reactions following treatment with Rabies Immune Globulin (Human) to the FDA at 1-800-FDA-1088 or www.fda.gov/medwatch. Also report these events to the Pharmacovigilance Department, Sanofi Pasteur Inc., Discovery Drive, Swiftwater, PA 18370 or call 1-800-822-2463. For wound infiltration and intramuscular administration only. Inspect parenteral drug products visually for particulate matter and/or discoloration prior to administration, whenever solution and container permit. If either of these conditions exist, do not administer the product. Imogam Rabies – HT is supplied in a 2 mL vial with a minimal potency of 150 International Units per milliliter (IU/mL). Vial, 2 mL, NDC 49281-190-58. Packaged as NDC 49281-190-20. Imogam Rabies – HT contains no preservative. Discard unused portion immediately. Store Imogam Rabies – HT in the refrigerator at 2° to 8°C (35° to 46°F). DO NOT FREEZE. Rabies antibody provides passive protection when given immediately to individuals exposed to rabies virus. (12) Studies of Rabies Immune Globulin (Human), (11) Imogam Rabies, given with the first of five doses of Sanofi Pasteur SA HDCV (7) confirmed that passive immunization with 20 IU/kg of Rabies Immune Globulin (Human) provides maximum circulating antibody with minimum interference of active immunization by HDCV. A double-blind randomized trial (6) was conducted to compare the safety and antibody levels achieved following intramuscular injection of Imogam Rabies – HT (heat treated) and Rabies Immune Globulin (Human), Imogam Rabies (non-heat treated). Each Rabies Immune Globulin (Human) was administered on day 0, either alone or in combination with the human diploid cell Rabies Vaccine (Imovax Rabies) using the standard post-exposure prophylactic schedule of day 0, 3, 7, 14, and 28. The treatment of both Rabies Immune Globulin (Human) and vaccine corresponded to the post-exposure recommended dose of 20 IU/kg of Rabies Immune Globulin (Human) and was administered in three equally divided IM injections of under 5 mL in either gluteus. Serum rabies antibody levels were assessed before treatment and on days 3, 7, 14, 28, 35, and 42 by the Rabies Fluorescent Focus Inhibition Test (RFFIT). Serum antibody levels were similar in the Imogam Rabies – HT and Imogam Rabies groups. By day three, 60% of each group had detectable antibody titers of ≥0.05 IU/mL. By day 14, the geometric mean titers (with 95% confidence interval) were 19 IU/mL (11-38) in the Imogam Rabies – HT + vaccine group and 31 IU/mL (20 to 48) in the Imogam Rabies + vaccine group. These differences were not statistically significant. Manning SE, Rupprecht CE, Fishbein D, Hanlon CA, Lumlertdacha B, Guerra M, et al. Human rabies prevention - United States 2008: recommendations of the Advisory Committee on Immunization Practices. MMWR. 2008 May 23;57(RR-3):1-28. State of Hawaii Animal Industry Division. Available at: http://hdoa.hawaii.gov/ai/aqs/. Accessed January 21, 2014. Rabies vaccines: WHO position paper. Weekly epidemiological record. 2010 Aug 6;85(32): 309-320. Available from http://www.who.int/wer. Accessed January 21, 2014. Fudenberg HH. Sensitization to immunoglobulins and hazards of gamma globulin therapy, pp 211-220 in Merler E, Editor Immunoglobulins: biologic aspects and clinical uses. National Academy of Sciences, Wash., DC. 1970. Pineda AA, et al. Transfusion reactions associated with anti-IgA antibodies: report of four cases and review of the literature. Transfusion 1975;15:10-15. Lang J, et al. Evaluation of the safety and immunogenicity of a new, heat-treated human rabies immune globulin using a sham, post-exposure prophylaxis of rabies. Biologicals 1998;26:7-15. Recommendation of the Advisory Committee on Immunization Practices (ACIP). Human Rabies Prevention - United States 1999. MMWR 1999;48:No. RR-1. Cabasso VJ, et al. Rabies immune globulin of human origin: preparation and dosage determination in non-exposed volunteer subjects. Bull WHO 1971;45:303-315. Loofbourow JC, et al. Rabies immune globulin (human). Clinical trials and dose determination. JAMA 1971;217:1825-1831. Fishbein DB, et al. Administration of human diploid-cell rabies vaccine in the gluteal area. N Engl J Med 1988;318:124-125. Helmick CG, et al. A clinical study of Mérieux human rabies immune globulin. J Biol Stand 1982;10:357-367. Habel K, et al. Laboratory data supporting clinical trial of antirabies serum in persons bitten by rabid wolf. Bull WHO 1955;13:773-779.
risks and benefits of this product. Dist. by: Sanofi Pasteur Inc.